Meet like-minded people currently in the city and make new friends. Meet your guide at your accommodation at 5:30 PM and depart right away on the back a motorbike. Get ready to experience the the insane Vietnam traffic! The only thing that really stands between you and some awesome vegan food is the ‘daily-dice-with-death’ traffic situation, but don't worry your guide is an experienced driver and will calmly lead you through the traffic. Your first stop is in District 3, a hip new spot with relaxed, historical environment all around. Here you’ll kick the tour off with a famous story about a Vietnamese Mahayana Buddhist monk who burned himself for protesting the persecution of Buddhists by the South Vietnamese government. After learning about the history of the people of Saigon, head up to a local vegan restaurant, a calm spot combined with nostalgic vibes, where you’ll savor "Banh Xeo" - vegan Vietnamese rice pancake served with fresh vegetables and vegan "fish sauce". Coming over District 10 then going off-the-beaten path and diving into Saigon’s deep-rooted culture. Visit a true maze of the biggest wholesale flower market and a local market inside to have an authentic local experience in hidden alleys by grilling banana crispy crackers and local hangouts that you should not miss out on. Don’t get too comfy among the cushions as we’ve got to hurry to experience the highest pagoda of the city "Viet Nam Quoc Tu" located in a quiet space with its spectacular architecture before closing! 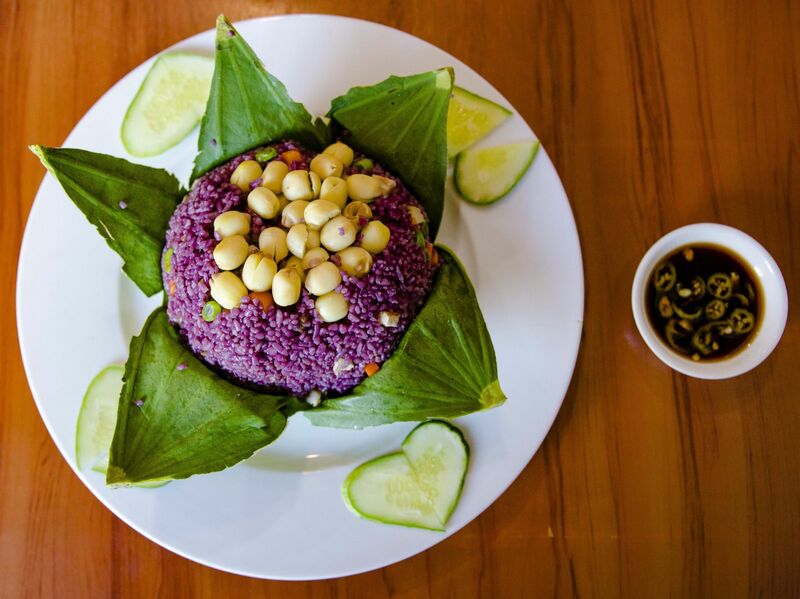 From there, cross the road to the most famous restaurant of Saigon to sample vegan food fares. At the peak of culinary innovation, let your senses run wild with carefully planned Vietnamese dishes featuring sustainable ingredients and sip on your old-fashioned water or vegan beer. Drive to District 5 and pass the local streets of the night life. Take a spin around on the journey along the banks of the Saigon River in District 4 - The perfect time to cross the bridge to Saigon’s bustling night scene. After getting a welcoming breeze from the back of the bike, we’ll finish you off with a sweet treat such as smoothies or a dish of fresh fruit. A camera is always encouraged, however it is not recommended that you take pictures while on the motorbike as this can be dangerous. If you wish to take pictures, please ask your guides to pull over. Please take extra care of your camera to avoid theft.